"American Buddhism’s numbers are booming. 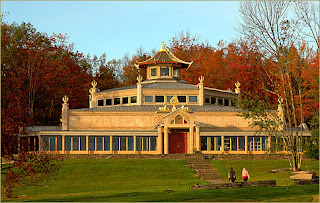 Published just over three years ago, an American Religious Identification Survey survey showed that from the years 1990 to 2000, Buddhism grew 170 percent in North America. By all indications that remarkable rate of growth continues unabated. There is no such thing as a historic North American Buddhist tradition, a fact that is crucial to understanding and facilitating Buddhism’s blossoming. This growth is all the more remarkable given that Buddhism was arguably the most recent import of a major religion to North America from the East..."
Family-friendliness may indeed be a feature of Western Buddhism where there is room for improvement. Maybe there are some lessons that Buddhists could learn from Christians regarding family-friendliness. Many churches in Britain, after a period of long decline, are experiencing growth in membership as a result of 'Messy Church' activities, which provide something for all the family. I'm not sure how well 'Messy Meditation' would go down with adults (mine's messy enough at the best of times), but perhaps Buddhist based activities for kids could be carried out in parallel to the parents' having a quiet hour to meditate and unwind. Crafts, music, drama activities (maybe small-scale productions based on Buddhist parables with occasional performances for parents), cookery etc could keep the kids happy while the parents attended drop-in style meditation classes.